When you first start shopping for a tripod, you might be a little shocked by the price range: there’s some for $20 and then there’s others for hundreds of dollars. So, what’s the deal with that huge price range? How could something so simple cost so much? Three metal legs for $500? I’ll admit that when I first got a digital SLR, I went ahead and got one of those generic $20 tripods. I tried to use that thing once, and after watching my camera slowly slide down after I kept locking it in, I decided to invest in a good tripod. The good part is that you don’t necessarily need to spend $500 on a tripod. 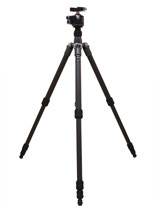 There are some very good ones for about $150, and they’re monumentally better than those generic tripods.